Small/Medium - $112.99 Medium/Large - $128.99 Only 6 left! X-Large - $128.99 Only 7 left! What do you call a hot shot fighter pilot who flies like a madman, and occasionally disobeys orders? Maverick, of course! And while he may be a dangerous loose cannon, he's also pretty much the coolest guy in the Navy. 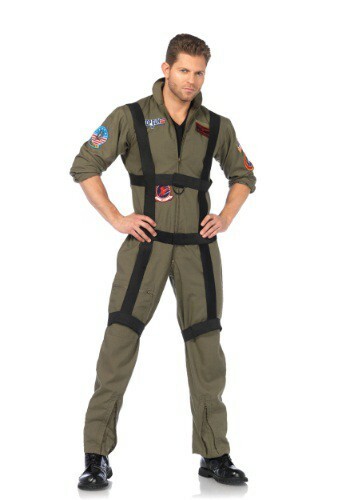 You'll look like you just came back from the Danger Zone when you wear this Maverick-approved Top Gun Jumpsuit with Harness to your costume party! Ordinarily, if someone were given the keys to a fast and deadly F-14 Tomcat, and then buzzed an air traffic control tower in it after being ordered not to, they'd probably be flying a mail delivery plane by the end of the week. But in Maverick's case, he got sent to school to learn the lost art of aerial dog fighting, and hopefully a little discipline and respect along the way. That's pretty much the classic movie Top Gun in a nutshell, along with some beach volleyball and romance stuff between the awesome fighter jet sequences set to rock music. Maverick always looks so slick, too, whether wearing his leather bomber jacket or his spotless white dress uniform, but he easily looks the coolest in his wicked flight suit. Maybe it's because he's also blowing stuff up while he's wearing it? You won't need to be a fighter ace, or even know how to fly, to look like Maverick at his coolest when you're sporting this realistic flight jumpsuit! It features real embroidered flight patches sewn to it, along with interchangeable name tags, and the parachute-style harness attaches to the suit with velcro. Just add a pair of aviator sunglasses, and you'll start feeling the need, for speed!